DAVIE, Fla. – On the first day of rookie minicamp, new Miami Dolphins receiver Jarvis Landry worked on routes needed as a slot receiver, an outside receiver, played gunner on special teams and even discussed the possibility of returning kicks. It could be that kind of rookie year for Miami’s second-round pick. [+] Enlarge The Dolphins ignored bigger needs earlier this month and drafted Landry because he’s a versatile and hard-nosed football player. He’s a wide receiver with the toughness of a hard-hitting safety. In fact, Landry was among LSU’s leaders in special-teams tackles during the early part of his collegiate career. That helped him earn the status of team captain last season. But finding a role in Miami as a rookie will be one of the challenges for Landry and the Dolphins’ coaching staff. The team already is deep at receiver with veteran starters Mike Wallace and Brian Hartline, in addition to quality backups Brandon Gibson, Rishard Matthews and Damian Williams. 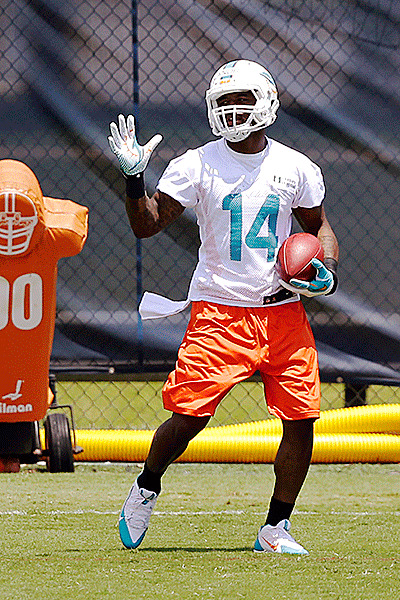 Landry could be as high as third on Miami’s depth chart by the end of training camp or as far back as fifth or sixth. Rookie minicamp and organized team activities are valuable for Landry to begin finding his niche. Special teams is a sure-fire way for Landry to get playing time in his rookie year. Landry was a strong gunner at LSU and also sure-handed enough to return kicks, despite the fact he doesn’t have blazing speed. If Landry or another rookie (Matt Hazel?) proves they can return kicks, it could put specialist Marcus Thigpen on the hot seat. The Dolphins like players with position flexibility and Thigpen hasn’t provided much as a backup running back or wide receiver. Learning multiple positions as a rookie is not easy. It is difficult enough making the physical transition from college to the pros. However, Landry must be on top of the playbook at multiple positions mentally, as well.